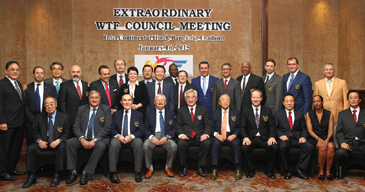 BANGKOK, Thailand (Jan. 16, 2015) — An extraordinary WTF Council meeting was held today at the Intercontinental Hotel in Bangkok, Thailand with the attendance of 25 Council members and two auditors. WTF President Chungwon Choue opened the meeting by thanking Dr. Nat Indrapana, the IOC member from Thailand, and Mr. Pimol Srivikorn, president of the Taekwondo Association of Thailand, for their great efforts in preparations for the meeting. Dr. Choue congratulated the two new WTF Council members - Mr. Sung-chon Hong and Mr. Jonathan Nnaji.